Limited Edition of 900 prints 15" x 19", and 50 prints 20" x 24", 1995. If you want the large 20" x 24" print, at £125, please phone to order. Birmingham has been a centre for craft skills throughout the ages and its manufacturing diversity has been renowned worldwide. As a focus for the canal system and later the railways, the city boomed during the Industrial Revolution. In the last century its location again proved vital for growth as it lay at the hub of the national motorway network. There seemed to be more Victorian shopping arcades than I remember, all of a more sumptuous quality than the malls of today; the Rotunda was just as squat (ground conditions dictated the planned height could not be built); the old cartoon cinema was now the Electric — what an elevation! 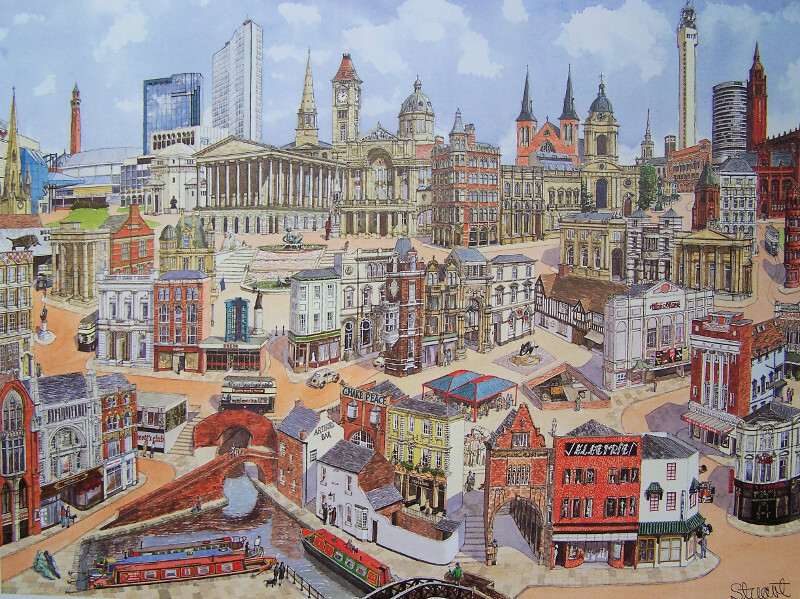 I couldn't resist putting my old Ford Popular and Morris Convertible into this Birmingham cityscape as well as the blue and cream Corporation buses that used to take me to school. Dominant of course was the fine detail of the Victorian architecture.